In 2013 Volkswagen Group: (Audi, Volkswagen, Skoda and SEAT) introduced new technology to diagnose, repair and replace components on new model releases from 2014 onward. ODIS is a service program from the Volkswagen Group. The program is used during our workshop diagnosis and can identify vehicle control modules, read DTC memory entries and assist with vehicle repairs through Guided Fault Finding. It allows functions such as measurement support, flashing control modules and vehicle self-diagnosis expand the range of application. Whilst providing us with all important information and services from the Volkswagen Group are available while working via a network connection to the group systems. 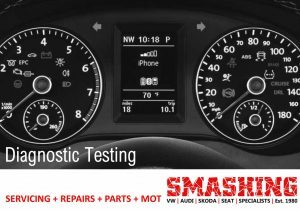 Here at Smashing (Leeds,West Yorkshire) we are fully equipped to perform all online diagnostic procedures performed by main dealers worldwide. Only workshops connected to VAG factory servers can correctly perform many procedures on the new models. This equipment is supplied by VAG Group Systems. It is the identical system used in VW, Audi, Skoda and SEAT main dealers. ODIS is licensed, supported and directly linked to VW Group in Germany for all repairs. All new models are now being built with unique security matched components. A system named ‘Component Protection‘. The concept behind Component Protection is to prevent the theft of VW, Audi, Skoda and SEAT vehicles for their increasingly expensive components. Without the support of the new online dealer system fitting many components has been rendered impossible for large numbers of vehicle repairers. ONLY ODIS online diagnostic system can perform this job correctly. Other tooling may remove component protection, but will risk damaging new components irreparably while attempting to perform this task. ECU Software updates are installed to prevent changing expensive electronic components developing faults of corrupted software. In many cases software updating can save hundreds of pounds by NOT replacing control units logged as “defective” fault codes. Many workshops are still unaware of this new repair technology. Genuine VW key orders are matched on VW Factory servers to your car. Only an online connection to the VW security server can match these genuine parts correctly without a risk of damage. For enabling VAG sound systems with lost radio codes. Only a legal and secure online connection can match genuine immobiliser components to your new car correctly without risking expensive and irretrievable damage to your cars electronics. Many tools fail to correctly set your next service reminder, ODIS correctly completes this task and reset the service timer. New models now require airbag systems parameterising online. • Autologic VAG – Bespoke VAG Diagnostic System. • Ross Tech VCDS / VAG Com Diagnostic System. • Autel Maxidas Multi Brand Diagnostic Tool. 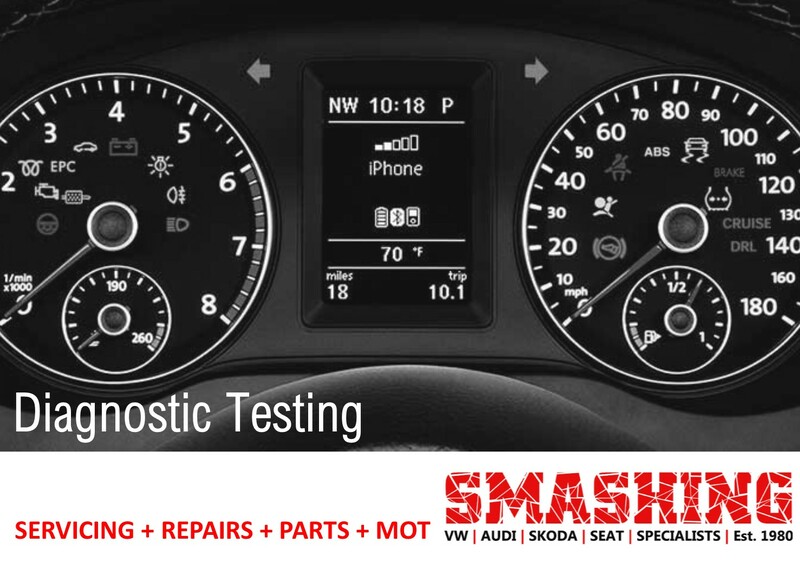 Smashing is a true Volkswagen, Audi, SEAT and Skoda specialist. We invest in equipment, dealer training and information systems (Including technical bulletins and safety campaigns vital to you and your cars well-being) used in the franchised dealer network. This allows us to provide a comprehensive specialised maintenance and repair solution for your car.